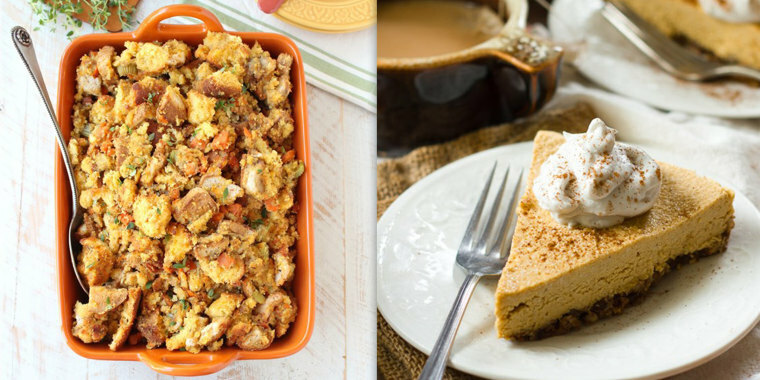 A gluten-free Thanksgiving menu might sound totally impossible, but these recipes prove it isn't! Food blogger Whitney Bond of Traditional Recipes with a Bond Girl Twist shared her favorite gluten-free Thanksgiving recipes from her site, her network of food blogger friends and TODAY Food. With the holiday's hallmark dressing, pies, breads and flour-thickened gravy, a gluten-free Thanksgiving menu might sound totally impossible, but I’m here to tell you that it isn’t! People don't even have to give up their traditional Thanksgiving favorites like stuffing, green bean casserole and pie to create a gluten-free menu. Here are 21 gluten-free Thanksgiving recipes that prove that a gluten-free turkey day can be a great holiday. My favorite part of Thanksgiving has always been the stuffing. It needs to be light, fluffy and flavorful, which is exactly what you get with my gluten-free sweet potato stuffing recipe. The dish also has a delicious combination of sweet (from the gluten-free cornbread and sweet potatoes) and savory (from the sage and thyme) flavors. Switch up the green bean casserole this year for a tasty Brussels sprouts casserole, made with an easy homemade cream of mushroom soup prepared with cornstarch instead of flour, to keep it gluten-free. This rich and creamy dish will be the hit of Thanksgiving. Don’t worry, it's possible to still have green bean casserole. This version of a traditional green bean casserole is topped with homemade crispy onions since the typical packaged kind contains flour — and no one should have to live without crispy onion goodness. I like to live by the motto that “everything is better with bacon,” and I can tell you that turkey is no exception! 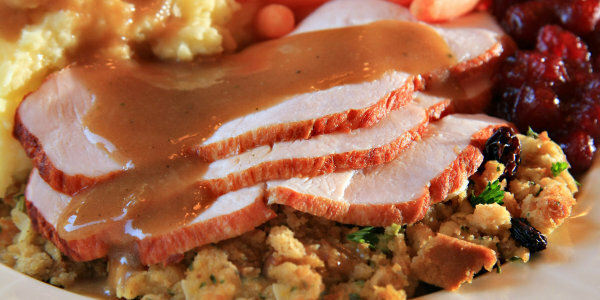 While most turkey recipes do not contain gluten, the gravy does. Luckily, this bacon-wrapped turkey breast is so moist and flavorful, that it doesn’t even need gravy. If ditching the gravy is simply not an option, try this easy gluten-free and paleo gravy that uses pureed cauliflower instead of flour to thicken the gravy. Cauliflower as a thickener? Total game-changer! 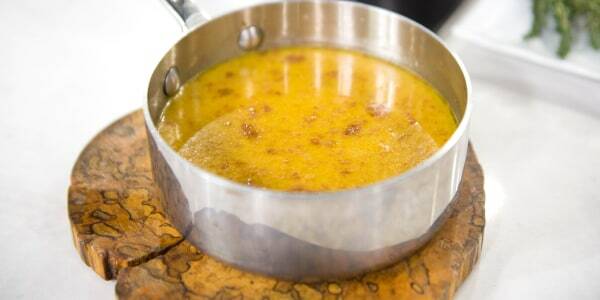 For a gravy with some sweetness, consider giving chef Seamus Mullens' gluten-free sauce a try. Sauteed apples, shallots and garlic are combined with apple cider and chicken broth in this sweet and savory gravy. Adding butter at the end thickens it to the perfect consistency. Butter comes to the rescue again in this smoky gravy that's made with lots of chopped bacon. Fresh herbs add some brightness to the sauce that's delicious on turkey. If these gluten-free popovers filled with fresh fall herbs aren’t just screaming to be pulled apart and dipped into some of that gravy, I don’t know what is! Creamy, dreamy mashed sweet potatoes are a naturally gluten-free side dish and a must for Thanksgiving. This recipe requires only four ingredients, making it an easy and affordable dish to add to the mix. Looking for a traditional mashed potato dish with a twist? Try this recipe, which adds cauliflower and fresh rosemary. Sweet, rich maple syrup is combined with tart apples and savory roasted Brussels sprouts for this delicious recipe that's guaranteed to become a Thanksgiving family favorite. This dish is naturally gluten-free, so there's no need for special ingredients to whip up this scrumptious side. Thanksgiving guests will think you're totally fancy when they see this pretty side dish. Instead of a traditional sweet potato casserole, serve them these hasselback sweet potatoes and they'll be hashtagging #YouFancyHuh in no time. This slow-cooker creamed corn frees up space in the oven for all of the corn's VISPF’s, aka, very important sweet potato friends, like hasselback sweet potatoes and sweet potato stuffing. Ditch the gluten-filled toasts and croutons this Thanksgiving and top soup with bacon. In this recipe, roasted butternut squash is pureed with apples and goat cheese for a unique and delicious flavor. A mentioned before, everything is better with bacon. Life motto, folks! What’s Thanksgiving dinner without a couple of appetizers to get the party started? These stuffed mushrooms are an easy appetizer that’s both gluten-free and dairy-free. In my family, sausage balls are a holiday appetizer must. This recipe is made with a homemade gluten-free biscuit mix and creamy mashed sweet potatoes for the ultimate holiday appetizer. 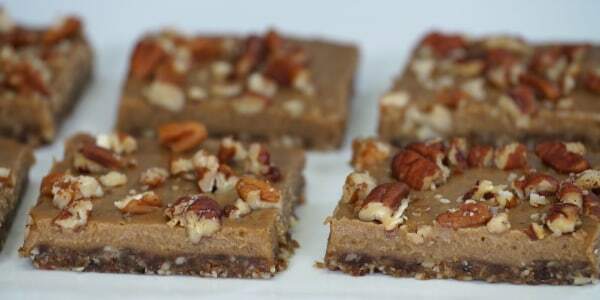 "These gooey, sticky and utterly decadent pecan pie bars are an incredible substitute for a tradition holiday favorite: the pecan pie," said Samah Dada, host of TODAY's "#COOKING with @DADAEATS" series. "However, you don't even need an oven to make this recipe because it's totally raw!" It’s not Thanksgiving without pumpkin pie, but a flour-based crust is out of the question. To make a delicious gluten-free crust, simply combine crushed walnuts and dates. It's sweet, nutty and the perfect complement to the creamy filling. Maybe you want to switch up the pumpkin pie this year, or maybe you want to have two pumpkin desserts at Thanksgiving. Don’t worry, I won’t judge! That’s where this decadent Pumpkin Spice Cake comes in. Bonus: it’s gluten-free and paleo. For a Thanksgiving dessert that’s both gluten-free and dairy-free, look no further than this vegan pumpkin cheesecake recipe. It has the creamy texture of a traditional cheesecake, plus a crunchy crust. It’s also no-bake, so there's more space in the oven for stuffing. On a final note, never forget that wine and rum are naturally gluten-free, and should always be served with booze soaked cranberries and apples during the holidays.